By combining fundamental, clinical, and population research, the members of the Nutrition and Successful Aging Research Section are attempting to identify the nutritional requirements of older persons and the nutritional determinants of successful aging. The researchers are also attempting to define the influence of nutrition, including the consumption of “functional foods”, on pathological, normal, and successful aging. In addition, Section members are using animal models to conduct studies that cannot be conducted with human subjects, in order to identify the molecular and cellular mechanisms by which nutrition affects the aging of tissues and systems. In preparation for the NuAge study, Section members conducted two pilot studies of older adults in 2000-2001, in which a questionnaire on past and present consumption of “functional foods” was developed and validated. This questionnaire captures information that will be essential for the NuAge study. The Section now has another pilot study under way, on the factors associated with insulin resistance in frail elderly persons. Findings from this study will be explored in greater depth in the NuAge study. This pilot study will also be used to test the sensitivity and reliability of several measurements that will be made on serum samples from the subjects in the NuAge study. The Section is currently conducting another study in collaboration with the Réseau de Recherche en santé bucco-dentaire du Québec (Quebec network for research on oral and dental health) to assess the effects of oral and dental health on seniors’ nutritional condition and their ability to maintain their autonomy. Lastly, the Section is conducting a study that examines an animal model of successful aging, involving moderate restriction of caloric intake in aging rats. (For more information on this study, see Aging Rat Colonies). This study uses DNA microchips to examine the gene expression profile associated with successful aging. Shatenstein, B., Payette, H., Nadon, S., Gray-Donald, K. and members of the Nutrition and Successful Aging Section, Quebec Network for Research on Aging. (2003). An Approach for Evaluating Lifelong Intakes of Functional Foods in Elderly People. J Nutr 133 , 2384-2391. H Payette, V Boutier, C Coulombe, P Gaudreau, K Gray-Donald, J Morais, B Shatenstein, I Dionne, G Ferland, T Fulop, D Jacques, MJ Kergoat, A Khalil, D Tessier, C Veyrat-Durebex, R Wagner. A Computer-Based Data Collection for the Quebec Longitudinal Study of Nutrition as a Determinant of Successful Aging (NuAge). Fourth European Congress on Nutrition and Health in Elderly People, November 2004, Toulouse, France. P Gaudreau, L Pomerleau, J Morais, A Khalil, I Dionne, G Ferland, T Fülöp, K Gray-Donald, D Jacques, M-J Kergoat, H Payette, B Shatenstein, D Tessier, C Veyrat-Durebex, R Wagner. Computerized Management of Biological Samples: The NuAge Study. 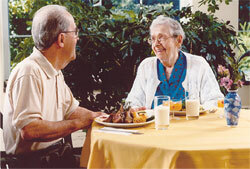 Fourth European Congress on Nutrition and Health in Elderly People, November 2004, Toulouse, France.